Building a new deck in the backyard of your home, can be a great plan, when it comes to maintaining an outdoor space, you can enjoy in the summers as a barbeque or a proper family lunch. It can be a wonderful addition to the home. If you are planning to build a new deck, then you need to make sure that you will get solid footings and structural support from the house. IF you are planning to build a deck just by yourself, then you need to do it right, and for that, you need to know the tips and tricks of building a deck just by yourself. Since, deck building requires a lot of expertise in the field, it is always better to go for a deck contractor. If you do decide to hire a deck contractor, then this article is for you. In this article, we will see some of the tips pertaining to hiring a deck contractor. Before even contacting a professional, the first thing that you need to do, is visualize your backyard, where you want to build a deck. A deck contractor is someone, who will come and solidify your vision, and cut the pieces which are not feasible and build the pieces which are feasible, but the initial plan should be made by you. 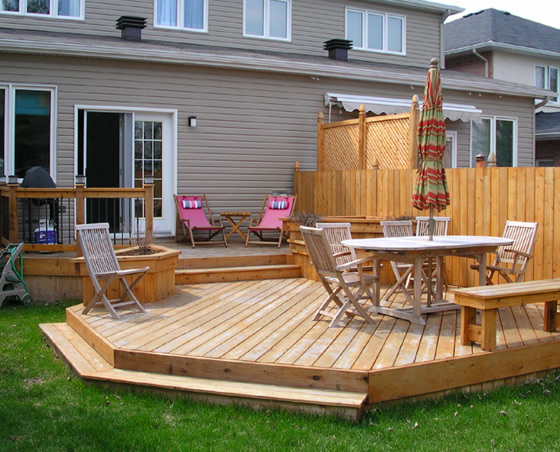 Some of the things you need to consider while, planning to build your decks are, the layout of the deck, staircases, type of railings, firepits etc. While you hunt for a deck contractor, it is really necessary you choose one correctly. Ask your neighbor, friends or colleagues, who has build a deck recently about their experiences while building the deck. Ask them to give recommendation for contractors they used for the deck building job. It is also important that you yourself research on the internet about the best deck contractors in your area. Make sure that you also read the reviews about them, given by their previous customers. It is also important for you as a customer to go through anything related to licensing, when it comes to hiring a decking contractor. Since, you will be giving the contractor access to the interiors of your house, hence it is important that you check their license first. How many years have they been doing business? If they are insured or not, and at the same time, licensed to carry out work or not? If they offer a warranty of the work that they do. When can they start the project, and how much time would they need to complete the project? If they would handle the cleaning and other works, which come after the main part of the deck has been built. If they can provide you with any references of previous customers that they have worked for. Besides these tips, you should also get a written estimate from your decking contractor, to make sure that he doesn’t charge you after the work is over. Capital Construction Services is the leading deck contractor in Austin. Call them to know more. Previous How Much Money to Have in a Savings Account?